Jason Statham has promised that The Meg will be a cross between Jaws and Jurassic Park, leaving fans with incredibly high expectations. The latest image from the upcoming movie is exactly what we've been waiting for. A popular horror sub-genre is the killer animal movie in which one of nature's many predators seems to decide that they've had enough and takes their primal frustrations out on any unfortunate human unlucky enough to cross their ferocious path. One of the most popular subjects of such a movie is the killer shark, which makes perfect sense, since the shark is one of nature's most mysterious and famous predators. In a new exclusive Empire feature, Jason Statham faces off with The Meg and talked about his role in the prehistoric mother nature horror movie. The nature's predator in question is The Meg, a prehistoric super shark that didn't go extinct like the rest of its ancestors. Statham said, "I play a former navy captain and diver and I get hired to rescue a team of scientists who are trapped at the bottom of the sea in their research station by a giant shark. Then all hell breaks loose." The premise sounds perfect for Jason Statham and it even looks believable with his name attached. 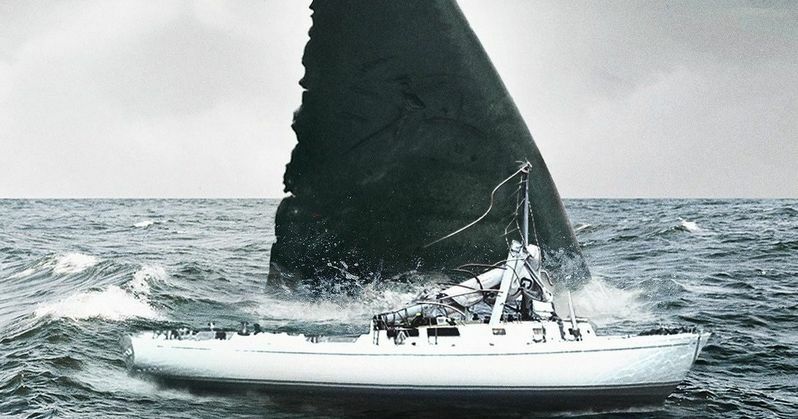 The Meg doesn't come out until August, which is just in time for Shark Week, but the movie looks to deliver some big money promises that the likes of Sharknado can't deliver. Though it sounds silly, the budget is far from a joke. $150 million is nothing to sneeze at and The Meg looks to tap into the fans of Jaws as well as the moviegoers who are still scared to swim in the ocean out of fear of giant prehistoric shark taking a limb or two. The Megalodon movie also looks like it will separate itself from the "Jurassic Shark" tag. The Meg producer Belle Avery has had the project in development for over 10 years and it's been a struggle to bring Meg to the big screen. She's described as the movie's "guardian angel" by author Steve Alten, who wrote the series of novels on which The Meg is based. Funny enough, when the movie's title is translated to Chinese, it reads as "Jurassic Shark." However, the new movie aims to distance itself from the comparisons, but it has a long way to since it's coming out for Shark Week. Sharks are big business and Jason Statham's comparisons to Jurassic Park are drumming up some excitement, but it's tough to see The Meg as anything other than "Jurassic Shark." The Meg will be a giant B-movie style blockbuster with suspense that will surely become a cult favorite in the years to come. While we wait for the release of The Meg, you can check out the new image of Jason Statham and the mega shark courtesy of Empire.